(A Visual Guide to Cannabis) — With the advent of medical marijuana in the United States, cannabis has afforded aficionados with a plethora of clever consumption methods! Seeing as legal marijuana sales in the United States are projected to pass 7 billion this year, it’s no surprise to see an increase in technological development dedicated to refining the extraction of cannabis’ key chemical compounds. We’ve provided a visual guide to cannabis that includes all the popular ways cannabis flowers (i.e. marijuana) can be transformed to get those coveted cannabinoids out of the plant material and into your blood stream, so they can provide your endocannabinoid system with the stimulation it deserves! Marijuana (marihuana) – The dried flowers and subtending leaves and stems of the female cannabis plant. Known to many as nugs or buds, marijuana is the most classic way of consuming cannabis. Picked straight from the cannabis plant and dried, marijuana is typically ground and smoked in a bong, pipe, joint, blunt, etc. Marijuana easily the tops of our guide to cannabis. Kilobrick – Also known as brick weed, Kilobricks are merely physically pressed cannabis leaves, heads, stems, and seeds into a brick. This preparation allows for efficient packaging, but usually consists of lower-quality marijuana distributed illicitly. Sinsemilla – Sinsemilla is, essentially, high-quality marijuana. As we describe in our blog article about the increase of cannabis potency, sinsemilla is the term used to describe the marijuana often found across top-notch dispensaries in California, Colorado, and Oregon—that “good good”. Sinsemilla represents the apex of potency when it comes to female cannabis flowers. Flowers of this type are meticulously grown with the intent of preventing pollination (no seeds!) and inducing high resin content. Kief – Kief is that lovely powder that you often find at the bottom of a grinder. When buds are agitated, the trichomes, which contain the majority of the cannabinoids, fall off. Kief is a mixture of trichomes and tiny bits of plant material that have fallen off the buds and is often used to up the potency of a bowl. Thai Sticks — Thai sticks are like the Cuban Cigars of the cannabis community! Popularized in Thailand, thai sticks consist of sinsemilla wrapped in cannabis leaves with a cannabis stem (or other stick like material) running through the middle to keep it aggregated (like a toothpick in your double-decker club sandwich). Often, users coat the buds in concentrates like wax and kief before adding the leaves to pack the extra punch. New, simpler, varieties of strengthened joints have emerged – twaxed joint and tarantulas. Twaxing is when you wrap shatter around the end of a joint, causing the potent concentrate to melt into the joint as it is burned. A tarantula is similar to a twaxed joint, except the joint is coated in melted concentrate (typically shatter or wax) and then rolled in kief or hash. Hash – Hash is a general term for any form of cannabis extract. However, most commonly if someone used the term “hash” they are referring to ice water extraction. Also called bubble hash or ice hash, this process uses ice water to freeze trichomes, making them easier to break off. The ice water and cannabis are mixed and agitated, then filtered through bags made of silk screen to separate plant material from the thichomes. QWISO – An acronym for Quick Wash Isopropyl Oil, this extraction process uses highly concentrated isopropyl alcohol as a solvent. The Alcohol and plant material is made super cold, then mixed together and agitated for less than a minute. Then the plant material and solution are separated and the alcohol is slowly purged, leaving behind only the extract. RSO (Rick Simpson’s Oil) – Rick Simpson oil as it is popularized by the man so named is a THC extraction made from the bud of the cannabis plant, and used for a panacea of ailments, most notably touted as the cure for cancer! There are various methods of extraction from using various solvents like butane, and naphtha to alcohol. The main difference being in the power of the solvent to dissolve and extract the THC-A which is then heated in a ban Marie or double boiler so as to evaporate the solvent and leave the extracted resin like material for use. RSO is usually applied cautiously (it’s potency is insane!) to the gums or skin. RSO is also known as FECO (Full Extract Cannabis Oil). BHO (Butane Hash Oil) – Butane extraction is the most popular in the industry. BHO can come in several different consistencies including shatter, wax, budder, sugar, crumble, live resin, and sap. The consistency and color will vary based on starting material, extraction process, and purging process. The extraction is followed by a “purge” – when the residual solvents are removed. Most BHO can be used to create the coveted and convenient THC-E Juice by following a simple recipe. Shatter – Shatter is a crystalline, amber, clear form of BHO. Shatter is clear because it is devoid of lipids that can sometimes be pulled from the plant during the extraction process. The lipids are either never extracted through a process called dewaxing or removed after the extraction using a process called winterization. During dewaxing, the cannabis is extracted with butane in a closed-loop system at cryogenic temperatures. The extreme cold keeps the lipids from being extracted with the cannabinoids and terpenes. Winterizing is a process that removes the lipids after extraction, but also using extreme cold to separate the lipids from the cannabinoids. Shatter is often purged using a vacuum oven over long periods of time. Wax – Wax is a form of BHO that usually has been whipped during the purging process. Wax is a Butane extraction that has not been dewaxed or winterized. Because the lipids from the plants still remain, the consistency after the purging is similar to earwax. Wax is popular because of its high potency and low cost in comparison to other concentrates. 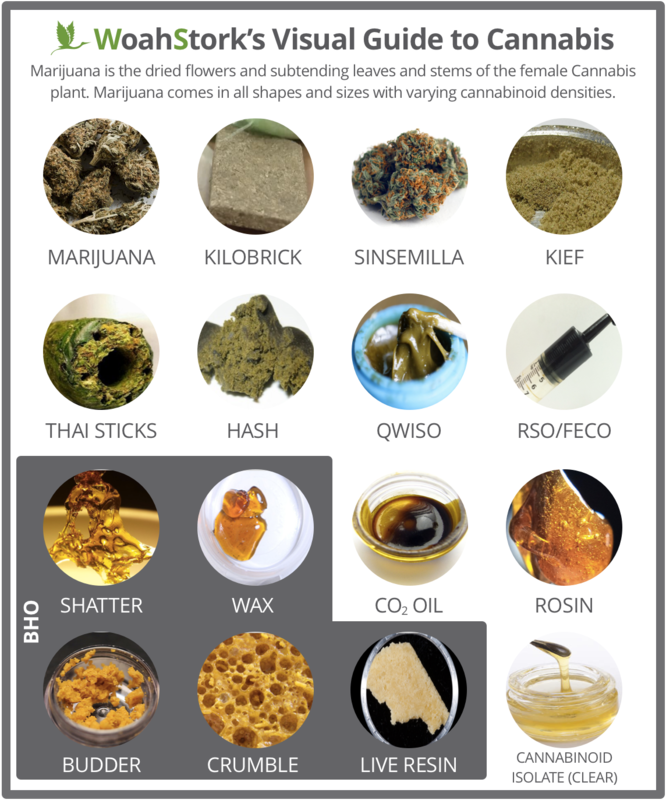 Wax is often times used an umbrella term for all concentrates, but we feel in this guide to cannabis that BHO is a more appropriate catch-all. Budder – Budder is another form of BHO. The difference between budder and shatter is the purging process. When making budder, in order to expedite the process of purging the butane, the solution is whipped, like butter, giving this style of concentrate its name. This whipping process introduces air to increase surface area taking away the clarity of the shatter. Budder is often confused with wax, but has been winterized or dewaxed. Crumble – Crumble is another form of BHO. After the extraction, the solution is put into a vacuum oven to purge the butane. Over time, the butane is removed and the product hardens into a crumbly, Swiss cheese-like consistency. Crumble also falls into the wax category, despite not being whipped. Live Resin – Skipping the drying/curing process, live resin uses frozen whole cannabis flowers as the foundation for a Butane extraction process (where Butane is used to extract the cannabinoids, leaving the chlorophyll and plant material behind). Live resin is renowned for its ability to retain a rich terpene profile after extraction. This is probably what drives its indistinguishable fresh taste and unique aroma when dabbed. With costs around $45 a gram in Southern California dispensaries, this preparation of cannabis is certainly the connoisseur’s treat! Rosin – Rosin is the newest form of extraction being done. It is made using heat and pressure to separate the cannabinoids from the flower. Rosin started off as a quick way to make a dab-able product from home. However, because it is solventless and simple to make, it has taken the industry by storm and industrial presses have made it commercially available. CO2 Oil – CO2 Oil is an extraction is very similar to butane extraction. Because carbon dioxide will evaporate at a low temperature, the preservation of cannabinoids in the purging process is ideal. CO2 is often considered to be a cleaner choice because unlike butane, it is not derived from petroleum. Cannabinoid Isolate – Made most well-known by the Clear, this is what happens when science meets cannabis. The process behind making this transparent, sappy concentrate is the only thing that isn’t clear. However, what we do know is that the final product is solvent free and in its raw form is over 99% cannabinoids. It is also very versatile – you can smoke it, eat it, vape it, use it sublingually, or topically. All of the cannabinoids are active and available. The clear is the perfect way to round out this guide to cannabis — it’s the future of the extraction industry.